Harmful fines and fees practices are most common in communities of color and, to a lesser degree, in low-income communities. 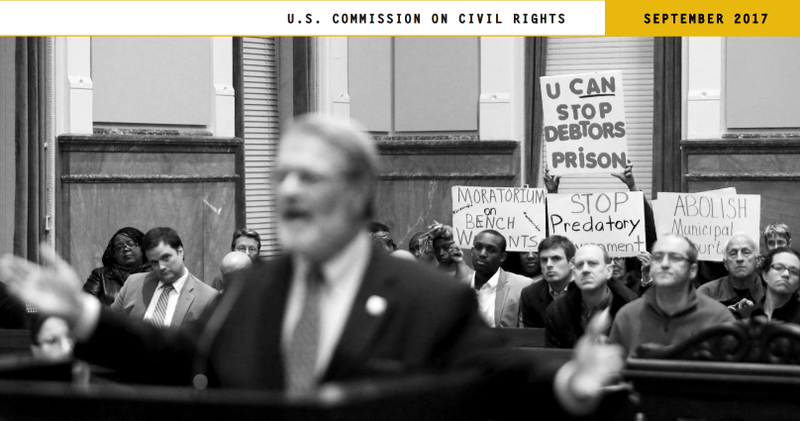 After holding extensive hearings, the U.S. Commission on Civil Rights issued a landmark report detailing the disproportionate harms that communities of color suffer from fines and fees practices. The report explains how the use of monetary sanctions by state and local governments dramatically increased over the past 30 years, describes the harms caused by harsh enforcement practices, analyzes the racial and economic disparities that often accompany these sanctions, and assesses U.S. DOJ’s enforcement and reform efforts. Finally, the Commission makes several recommendations for courts and jurisdictions. The targeted imposition of fines and fees on low-income communities and communities of color not only impacts the ticketed individuals within those communities, but also impacts the efficacy of and public confidence in the judicial system as a whole. National data on the extent to which individuals are jailed or otherwise penalized because of their inability to pay fines and fees are insufficiently developed. A lack of data prevents stakeholders from fully capturing the impact of fines and fees on individuals within low-income communities and communities of color. Courts and municipalities should implement effective, accessible, and understandable processes for determining indigence before imposing any fines, including the appointment of counsel as appropriate. Judges should use bench cards to ensure consistent application of ability to pay standards. States and municipalities should remove conflict of interest incentives to assess fines and fees by, for example, ensuring that the revenue generated from fines and fees is allocated to a general budget rather than to fund specific municipal or state activities associated with fee collection. States should use taxpayer dollars generated by all citizens to fund the expansion of courts or other projects and programs, particularly projects and programs unrelated to the underlying offense, because society as a whole benefits from them. States should not suspend a driver’s license for failure to pay fines and fees without determining whether a person has the ability to pay. Judges should have authority to exercise discretion to allow alternatives to driver’s license suspensions for drivers who owe court fines and fees. Courts and municipalities should establish a program to provide counsel at no cost at the imposition of a fine or fee and at an indigency determinations as appropriate.